This article is part of the Researching the unknown project, a collaboration with researchers from Queen Mary University of London (QMUL), bringing you the latest research on the forefront of physics. Click here to read more articles from the project. One glorious day in July 2012 physics took center stage in the world news: scientists at CERN announced they had discovered the Higgs boson. The elusive little particle had been predicted all the way back in 1964, and finally traces of it had been glimpsed at the Large Hadron Collider (LHC). Last year, in 2013, Peter Higgs and François Englert were awarded the Nobel Prize in Physics for their prediction. Peter Higgs visiting the LHC in 2008. Image © CERN. But the search for new physics at the LHC is not over yet. 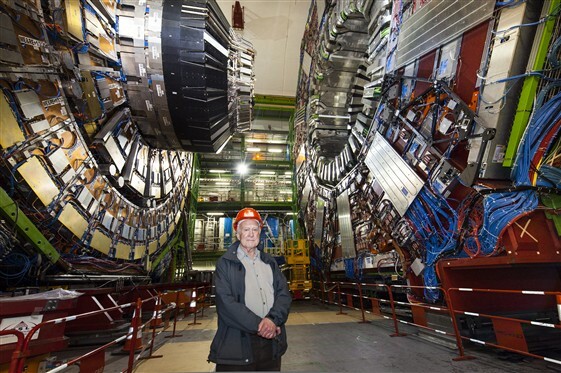 "Just because we found a new particle, this doesn't mean the job is done," says Adrian Bevan, a particle physicist at QMUL who is involved with developing a new and more powerful version of the LHC. "In 1964 the challenge was laid out, 'go find this new particle'. It's taken a bit of time, nearly 50 years. Now that we have found it we still don't know whether it's exactly the same thing that was envisaged back in '64. If it is, then there is the subsequent question of whether it is one of many Higgs bosons in a higher theory that we haven't stumbled on experimentally yet." The Higgs boson is just one piece in a huge jigsaw puzzle physicists are working on: to describe all the fundamental particles that make up the world we live in and the forces through which they interact. One grand idea in this context is called grand unification: perhaps at the start of the Universe all the forces we see today, gravity, electromagnetism, the weak nuclear force and the strong nuclear force, were one and the same thing. As the Universe cooled down from the Big Bang, the single super force became lop-sided in several ways, condensing out into the various forces we now perceive as distinct. The idea of unification has a long history. In the 17th century Isaac Newton showed that the force that causes an apple to fall to the ground and the force that causes the Moon to orbit the Earth, though apparently different, are one and the same thing: gravity. Around 180 years later James Clerk Maxwell realised that electrostatics and magnetism are just different aspects of a single thing called electromagnetism. And in 1984 Abdus Salam and Steven Weinberg showed that the electromagnetic force and the weak nuclear force, which causes radioactive decay, are different aspects of a single force called the electroweak force. "Because of this past performance, we expect, or hope, that there may be some kind of grand unified theory," says Bevan. There is a candidate theory, written in the language of mathematics, that describes such a unified picture: it's called string theory. Within the string theory framework there are many different models. Each exhibits a property called supersymmetry and each gives its own range of predictions. So far there isn't any experimental evidence that this framework is true, but it has seduced many physicists, especially those of a theoretical bend, through its mathematical beauty and elegance. For experimentalists supersymmetry sets new challenges. "We're essentially at a juncture in modern physics," says Bevan. "We want to push our understanding and we have a lot of inspiration from the theoretical side. The work lays down the challenge to the experimentalist to go and get a game-changing experimental result." An Aerial view of the LHC. 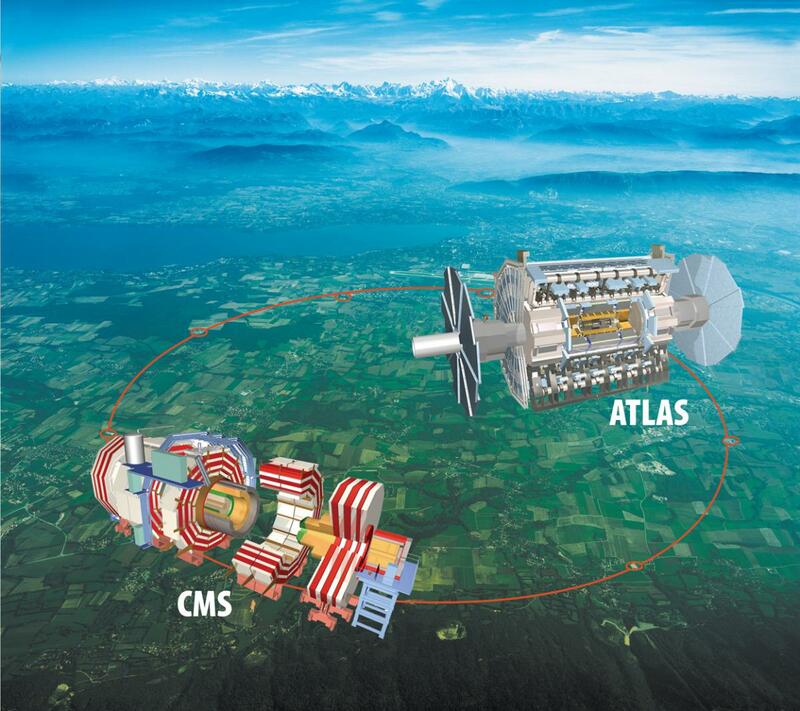 The CMS and ATLAS experiments, shown in the image, were involved in the 2012 discovery of the Higgs boson. Image © CERN. One way to get an experimental handle on supersymmetry is by looking for species of particles that have never been observed before, but which according to the theory should exist. For every particle we know of there should be a twin, a supersymmetric partner particle. As far as the Higgs boson is concerned, various versions of the theory predict that there may even be a whole range of different Higgs-like bosons. "A lot of work that's going on at the LHC is looking for some sign of supersymmetry, and these hypothetical additional Higgs particles are one aspect of supersymmetry that people would be looking for," explains Bevan. Evidence for supersymmetry may only reveal itself at very high energies. The LHC accelerates particles called protons around a large ring, housed in a 27 km long circular tunnel beneath the border between Switzerland and France. When these protons collide and break apart other, potentially new particles emerge. It's the energy with which the protons collide that needs to be high. "There's a huge energy scale between what we're exploring currently at the LHC and the [scale] at which we hope the forces are unified. Somewhere in that range we should see something new happening, although that's not a dead cert. But we have strong theoretical indications that there should be new physics appearing in that high energy range," says Bevan. What we need, then, is a more powerful LHC. Currently the LHC is undergoing an upgrade that will crank the energy with which the protons collide up to the full 14 TeV the accelerator was designed for. But Bevan and others are working on a more ambitious high-intensity upgrade for the LHC they hope will come into action around 2025. This will pump more protons through the accelerator in tighter bunches, increasing its luminosity — that's the number of interactions that take place per unit time. The new high-luminosity version of the LHC is expected to generate ten times more data than the LHC will during its lifetime. This is important because more interactions mean more data to study the properties of the Higgs boson. It's also important for statistical reasons. The particles physicists would like to understand and discover only exist for the briefest of moments before they decay into something else, so there is no chance of catching sight of them directly. "Even before the particles actually expand out to [where the detectors are], that moment is gone and those particles have decayed," explains Bevan. "Sometimes they'll also decay again, so you end up with a cascade of things that are happening." Bevan spends part of his working life developing the detectors that will sense what's going on in those many high energy collisions. "We are working with collaborators, both in the UK and around the world, on developing silicon detectors that will be fast enough, and radiation hard enough, to operate in a high-luminosity version of the LHC," he explains. "What we are trying to do is build a large scale, 100 or so square metres in size, silicon [detector] that we wrap around the interaction point. We cocoon [the interaction point] in a kind of onion shell of silicon so that when protons collide with protons, and [produce] other particles that may or may not be of interest, those other particles travel through the silicon and deposit charge. We can collect that charge and process it." That's the starting point for the reverse engineering process. Building the high-luminosity version of the LHC is a long-term project. "The expectation is that over the coming decade preparations are going to be put in place," says Bevan. "Then, from the experimental side of things, about five years before we would want to install the detector, we need to go into a production-build phase. A lot of activity in the workshops and laboratories, like the ones we have here at QMUL, will be going into building and testing all of the integral components. Of course, one of the things we require is strong collaboration with certain parts of industry. We can't do all of this ourselves, we do rely on high-tech industry and precision engineering firms to support this endeavour as well." 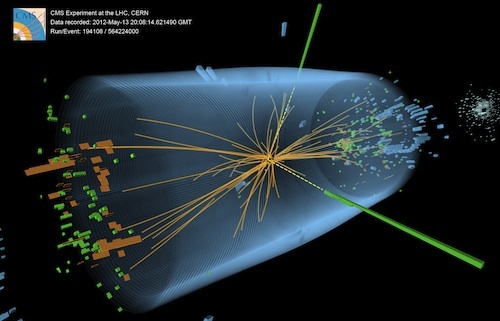 It's a huge and expensive endeavour, but potential rewards go beyond pinning down the exact nature of the Higgs boson. If evidence for supersymmetry is indeed detected, then this will lead us closer to solving other mysteries of the Universe. One of them is that around 25% of the matter in the Universe is invisible to us and its nature unknown. Theory suggests that this so-called dark matter (find out more here) may be made up of those supersymmetric particles yet to be detected. Another mystery concerns a form of matter we do know exists, called anti-matter. The trouble here is that according to standard theory there should be far more anti-matter in the Universe than what we actually observe. The blatant asymmetry between matter and anti-matter is a problem that Bevan and colleagues at QMUL are particularly interested in (see this article). And it's something that the high-luminosity version of the LHC may well shed further light on. It's possible, of course, that none of the new particles or phenomena that physicists have predicted will be detected at the LHC. But this wouldn't count as a failure, as the large amount of data that will be generated is likely to point to new directions. "If we don't find something, a new particle that pops out in the next ten years, we may find that, actually, some of the other measurements will give us some sign of how to move forward," says Bevan. "I'm confident that we will learn some very interesting things about nature over the coming decades." 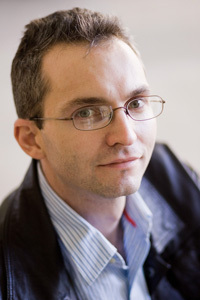 Adrian Bevan is an experimental particle physicist who has worked on projects at the SLAC National Accelerator Laboratory in California, and both CERN and the Paul Scherrer Institute in Switzerland. He works on the ATLAS experiment and its high luminosity upgrade at CERN, on the BaBar experiment at SLAC, and also writes the occasional phenomenology paper. He is author of the book Statistical Data Analysis for the Physical Sciences (aimed at undergraduate physics students) and co-editor of the tome Physics of the B Factories that chronicles the physics harvest from the BaBar and Belle experiments at SLAC and KEK, respectively. Marianne Freiberger, Editor of Plus, interviewed Bevan in London in February 2014.